The SQL Server Integration Services includes the Logging Services (Logs). So that you can use them in SSIS packages, containers, tasks etc. 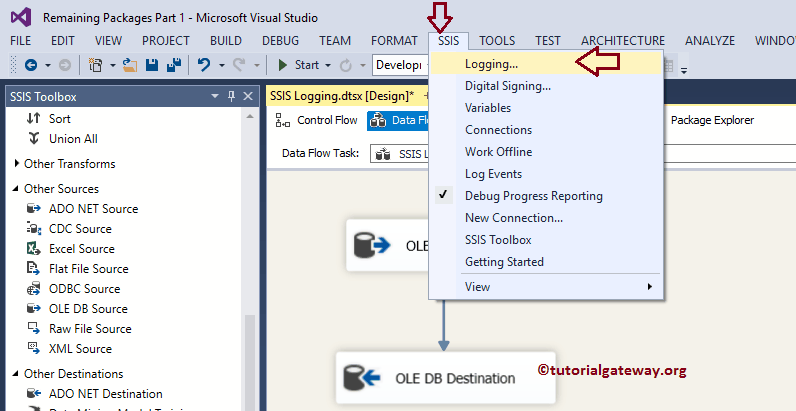 In this article, we will show you the steps involved in SSIS logging (saving the log information). 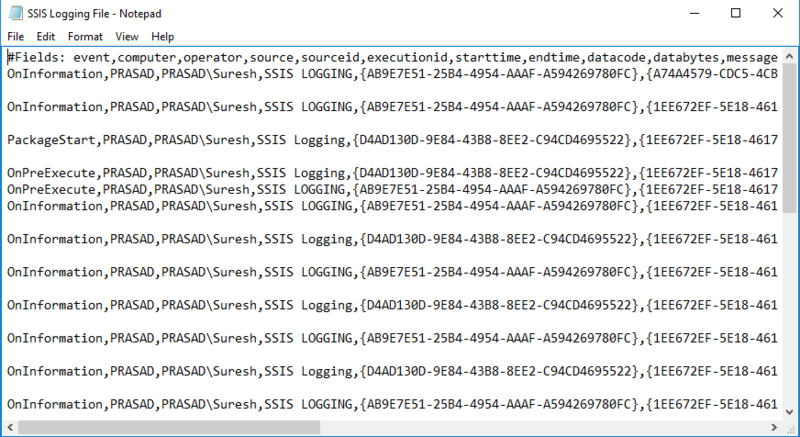 For this SSIS logging demonstration, we are going to use the below-shown data. 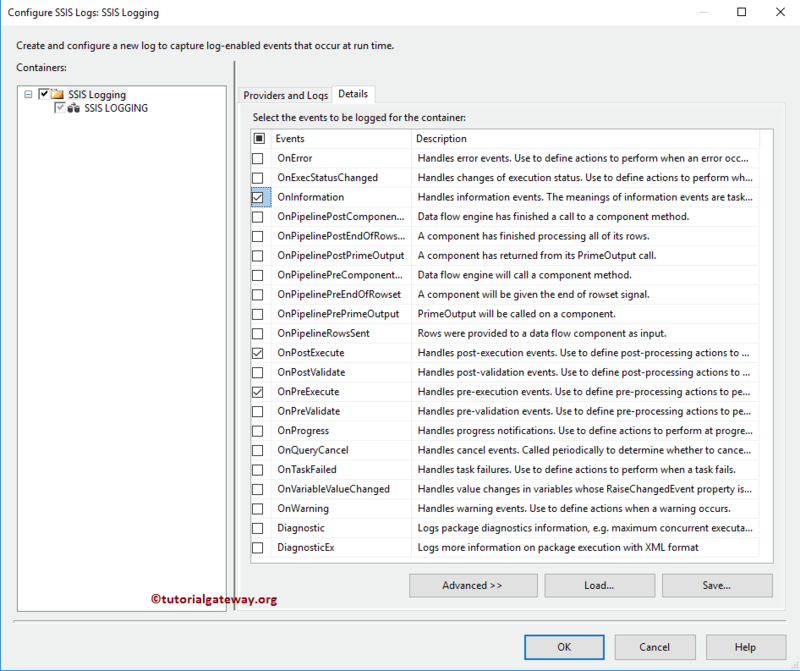 In order to explain the SSIS logging concept, Drag and drop the data flow task from the toolbox to control flow and rename it to SSIS LOGGING as we shown below. Double click on it will open data flow tab. Drag and drop OLE DB Source, and OLE DB destination on to the data flow region. Double click on OLE-DB source will open the Source Editor. From the below screenshot you can see that we are using the [Employee] table present in the SQL Tutorial database. 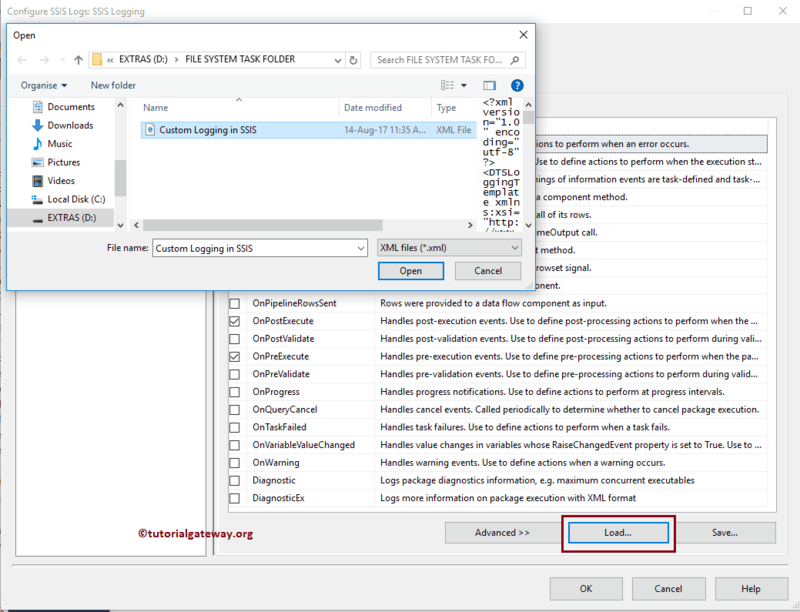 Please refer OLE DB Source in SSIS article to understand the available options in OLE DB source editor. 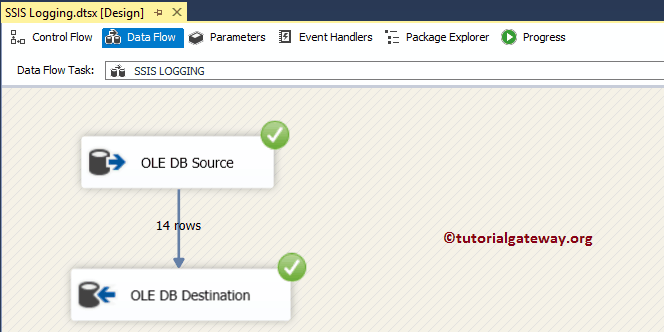 Double-click on the OLE DB Destination will open the to OLE DB Destination Editor to configure the target database. For the time being, we are selecting the existing table Table called [SSIS Logging Example Table]. Click OK to close the OLE DB Destination editor. 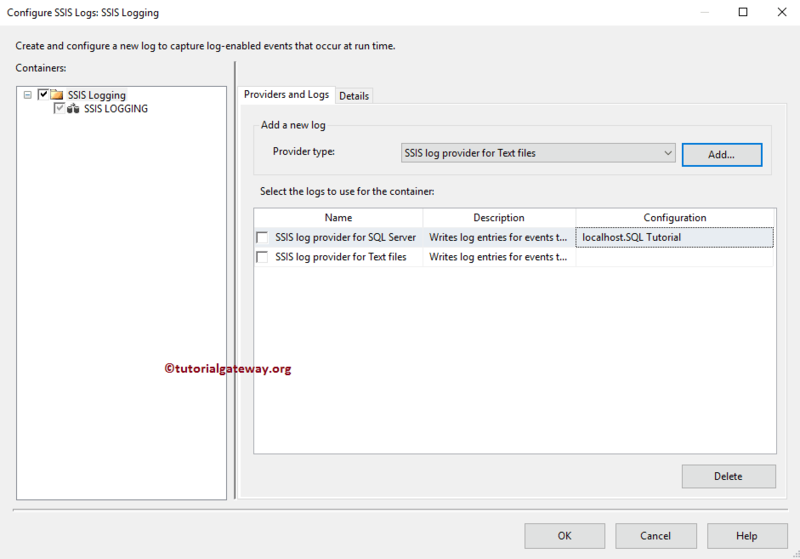 In order to configure SSIS logging, please navigate yourself to the SSIS menu, and select the Logging (submenu) as we shown below. Please checkmark the package (folder) to remove the warning message. 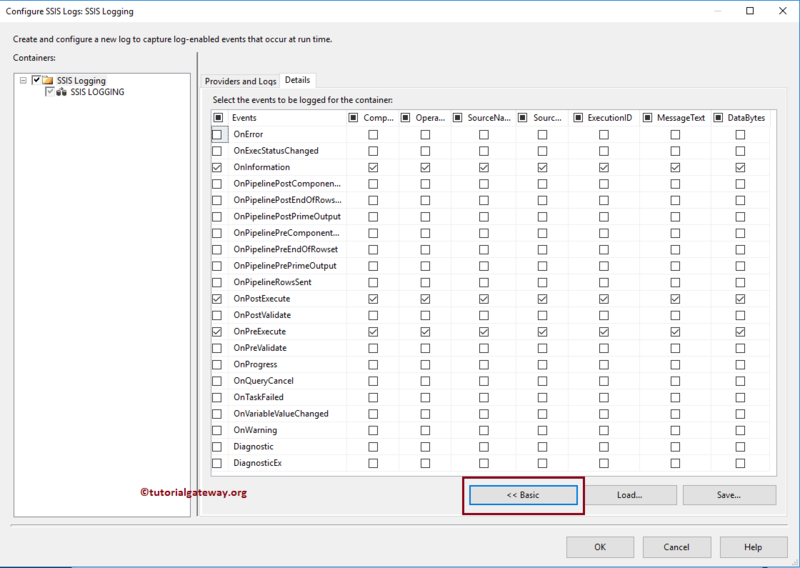 You can see the list of available ssis logging options at the provider type property. Log Provider for XML Files: The logging information that you want to store will be written to an XML file. 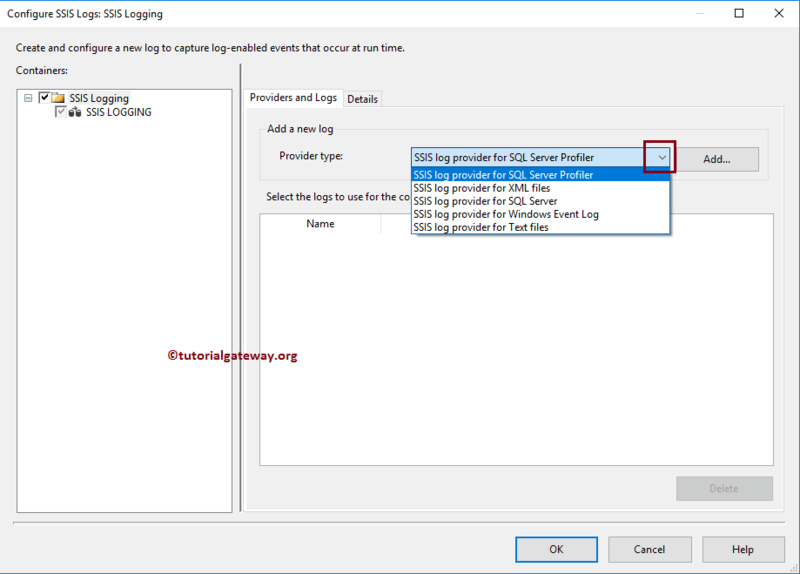 Log Provider for Windows Event Logs: It will store the SSIS log information in the local computer. It is under the Application log on the Windows log. Log Provider for Text Files: This option saves the Log information in the comma separated value (CSV) format. The default extension is .log but you can change it to .txt as well. Next, we have to configure the connection string (Database along with the credentials). For now, we are selecting the existing connection that is pointing to the SQL Tutorial Database. Next, we added one more provider i.e., Text files. 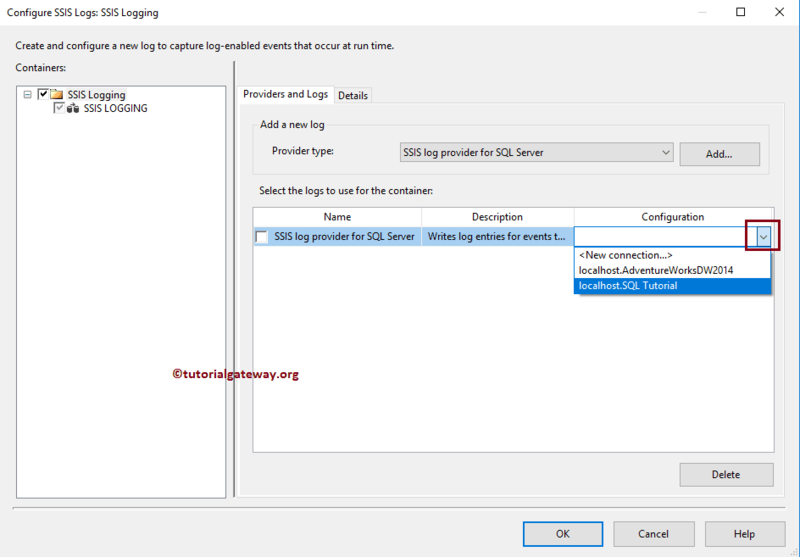 It means log information will be stored in both the SQL server and the text file. Currently, we don’t have any File connection in the package so, click on the <New Connection..>. Once you click on the <New Connection..> option, File Connection Manager Editor will be opened to configure it. In this example we are creating a new file so, we are selecting Create File option from the Usage Type. Next, Click on the Browse button, and add the file name at the location (file system). 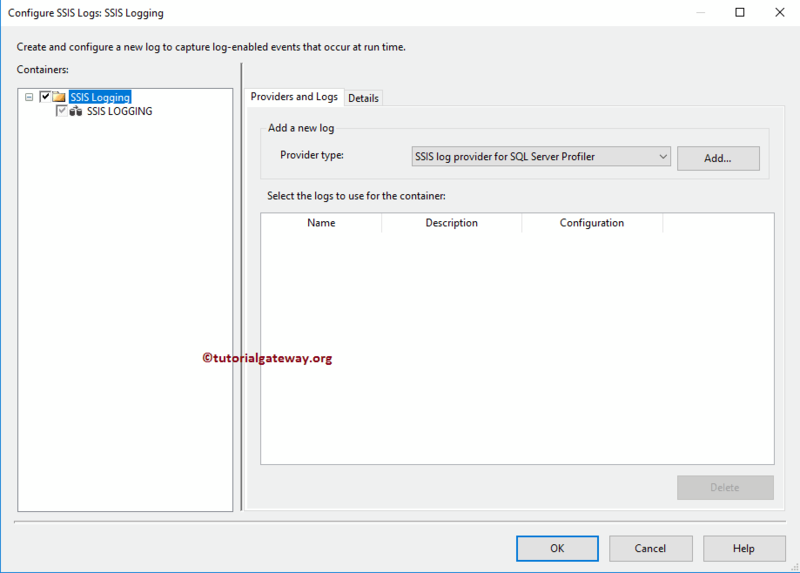 Below picture will show you the list of available events in the SSIS Logging. Please read each and every event so that you can understand the meaning of them. As it is in simple English we are not explaining the events. 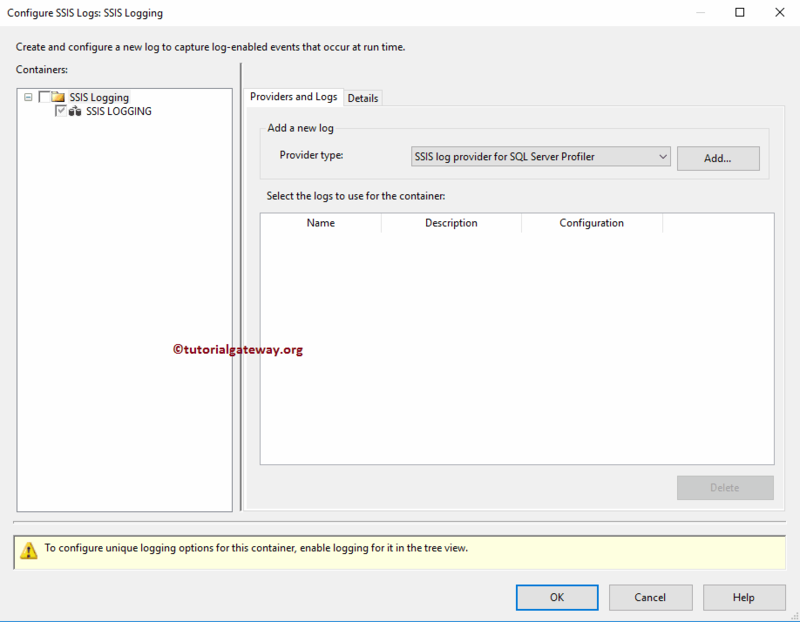 Save button: This button is to save the configuration settings of a SSIS logging that we configured here in an XML file. 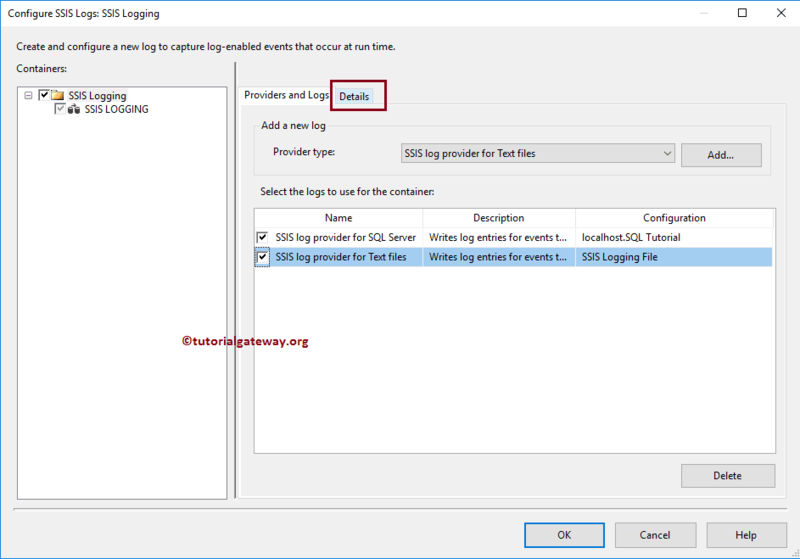 Load button: Use this button to load the existing SSIS log configuration settings XML file. 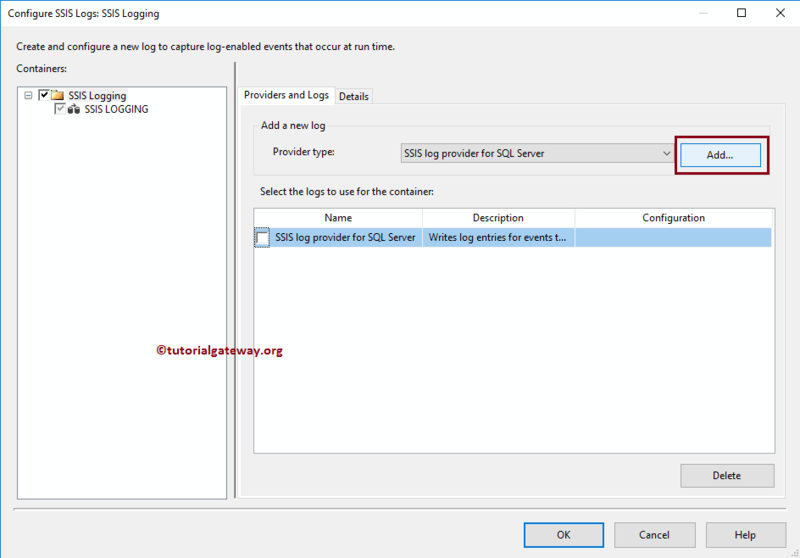 Click OK to close the SSIS log settings, and run the package. 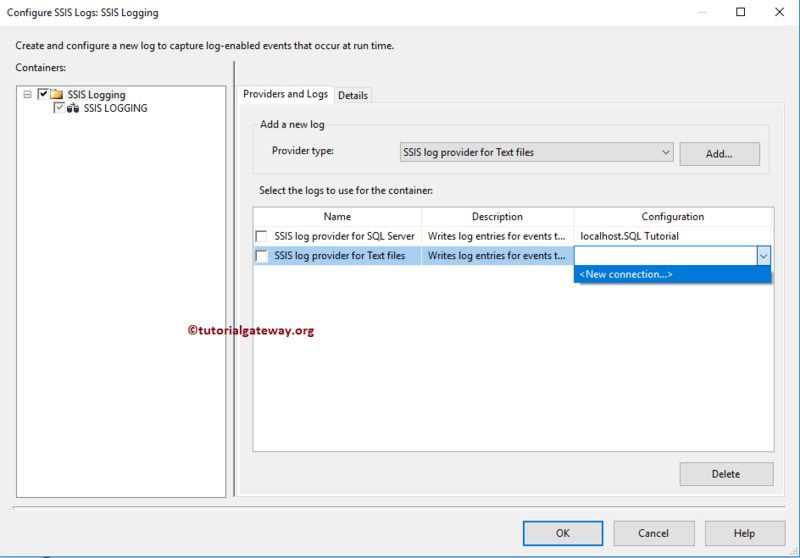 Let me open the SSIS Logging file present in the file system. From the below screenshot you can see the log information in the specified text file. Please open the SQL Server Management Studio. Under the specified database(here it is SQL Tutorial), and go to the Tables folder -> System Tables. here you will find the sysssislog table.